Hey everyone! 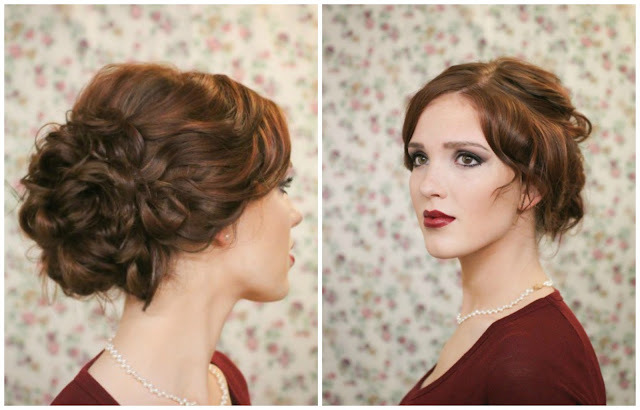 Welcome back to my blog, and also to the last day of the holiday hair tutorial week! I've been really enjoying flooding you guys with these styles, because I have so many that I want to pass on all the time between all my ideas and your requests(thank you by the way! ), so it's great to get a weeks worth out of my system all at once:) Today's style is a little special to me, and I'll tell you why right after you take a look! Step 1: Start by teasing your hair at the crown a bit for lift if you think you need or want it. Separate your hair in half by a straight line from one ear to the other. Tie your back half into a low ponytail and gently tug the hair out of the ponytail at your crown, again for a little extra lift and volume. Choose a side part, spritze on some heat protectant, and curl the front two sections of your hair in 1 inch curls. Step 2: Next curl your ponytail in 2-3 inch sections, grab all the hair in one hand and press it all to your head, directly over the ponytail holder. Using 10-15 bobby pins, secure the bun from in-between the fingers of the hand holding it, till you have a nice lumpy bumpy bun! Starting with the the curls closest to the back, you're going to take a couple at a time and swag them back and up on top of your bun, securing the end in place with a bobby pin or two. Well I hope you like it! Again I try to be as descriptive as possible, but then if I do too much text or pictures I think people get intimidated and are maybe afraid to give it a try, so I hope you're not one of those people and really see how simple and easy going this style is! Thanks so much for visiting this week and for leaving all the feedback about these styles (you know who you are:)), and remember that I love fulfilling your hairstyle requests so feel free to send them my way! I'll be back here every day of course, but in case I don't see you, have a very Merry Christmas next week! Saving the best for last, eh? I absolutely love this one! I have thick curly hair and this would work perfectly on mine. Thanks for posting all these gorgeous tutorials this week! You are so talented! This is so pretty! Were you a hair dresser before having kids or is this just a hobby? You are so talented! Love this style! This is lovely! The perfect effortless, gorgeous for a bride! Very pretty! Do you have layers in your hair? Absolutely gorgeous :) You definitely have a gift when it comes to hair! Beautiful! Can you tell us what lip color you are wearing and how you liked it? It's a fabulous color, just what I've been looking for! I love your hair! What do you ask for when you get your hair cut? I found your blog recently and have enjoyed reading it. The hair tutorials, in particular, have been super. :) I have long hair and the pictures and detailed instructions are perfect. Thank you! 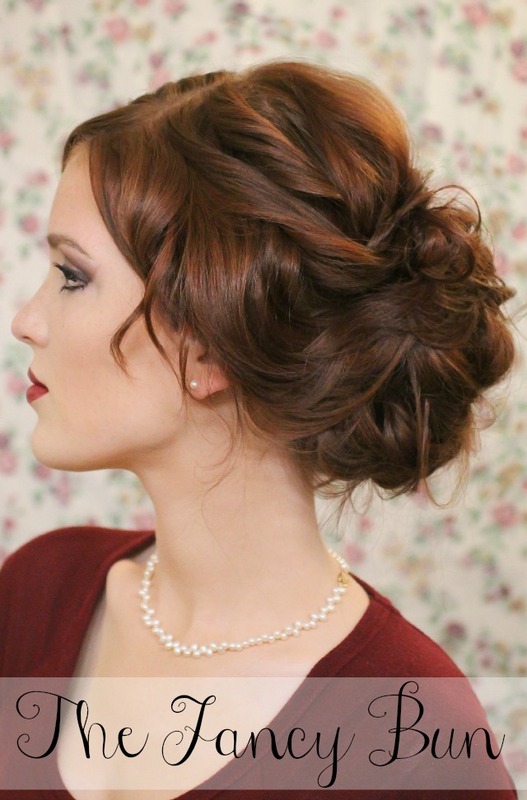 I love this updo and your hair is just to die for. Gorgeous! Your hair is gorgeous! 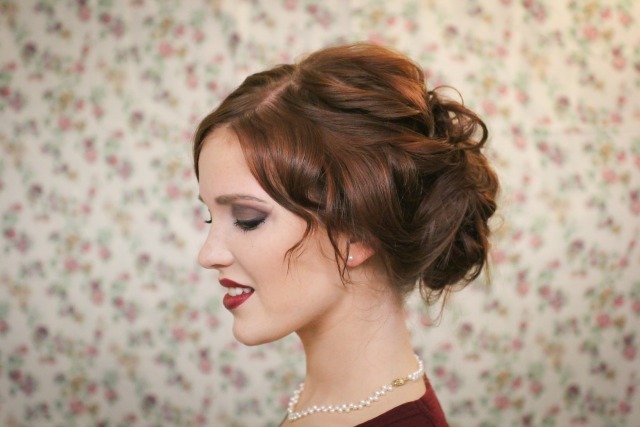 I'm going to try this updo! But also, what lipstick are you wearing? It's PERFECT! I love your hair! It's gorgeous. I'm definitely going to try this updo. Also, What lipstick are you wearing? It's PERFECT! I found this tutorial through a google search because I was trying to figure out what to do with my hair for this black tie event I went to. It was so easy and so simple and it took me less than 20 minutes to do it. I got so many compliments on my hair tonight. Thanks for being so descriptive and putting this out there. I will definitely be doing this hair style again! Make a video of this one! Because, the step 2 is a bit confusing and would be better see it on yourself! This would be so pretty at prom - for a parent too! Thank you for including all the steps because when I've tried to copy hairstyles without the step-by-step instructions, they always fall down. You've taken the fear out of trying. How long does one's hair need to be for this? It's awesome!